For most of us a bicycle is a child's toy, equipment for our sport. For many around the world, a bicycle is a tool that vastly improves their lives. In order to help those less fortunate than us I'm bringing together two of my favorite things: cycling and coffee. 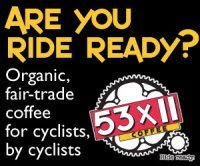 For the next 2 weeks, when you purchase 53x11 Coffee through Tour de Bike, profits will be donated to World Bicycle Relief. This is an amazing organization that provides bicycles in Zambia, changing people's lives. Purchase your next bag of coffee here! Remember, only by purchasing 53x11Coffee from THIS site, will you be contributing to this great organization. Not only will you be making the world a little better, you will also enjoy great fair trade certified organic coffee at the same time. Click on any 53x11Coffee banner on this site. Next time you enjoy your morning cup, you can feel good and do good. What's the impact of a bicycle? My kingdom for a tube! It was a beautiful day for the 30th Annual Rosarito-Ensenada Fun Ride. I had been looking forward to this ride. The day however would end up being dissapointing. Entries were very low. This is the third year I've done this ride and where three years ago there were around 9,000 riders. This year there may have been 3,500 if that. I'm sure that part of the low trunout is the media attention Tijuana has received due to drug related violence and rash of kidnappings. This was compounded by the announcement last year that the ride was to be cancelled. It all added up to a small turnout. The weather was fantastic. Temperature was in the 70s, blue skies and a light breeze coming off the ocean. Perfect conditions. My plan was simple. Start easy the first 10 miles, pick up the pace for the next 10, but save energy for the climb. Get over the climb and then time trial the last 10 miles or so into Ensenada.Things were going well. As we veered away from the coast and headed inland we started to descend into a small valley just before the big climb. The descent ends with a small bridge over a dry river bed. The seams along the bridge were a bit wide, but manageable. I rhythmically thumped along the bridge positioned towards the far left with riders to my right. I was boxed in. I approached the next seem and saw that the pavement had crumbled and there was a pretty wide rut. I hit it hard with the front tire and then again with the rear. Immediately I heard the hissing of air leaving my front tire. I knew both tires were flat before I dismounted. Pinch flats happen when you hit a hard edge or a curb with enough force that the rim pinches the tube. This usually leaves two holes in the inner-tubes. My problem? I had only one tube with me. I replaced the tube in the back wheel. I tried to patch the tube in the front wheel. A few seconds later the tire had gone flat again. I tried to patch it a second time, used my last CO2 cartridge. I thought it was going to work, but the front tire was flat before I remounted. I waited about 40 minutes to see if a Good Samaritan would "lend" a spare tube. But no such luck. I packed it in, got a ride back to Rosarito and my ride was done. Lesson learned: On a big ride, carry two tubes and more C02 cartridges than I might need. It was a big bummer. But I'm getting ready for my next ride. The San Diego Century. I'll be riding 100k for that one. For Southern California cyclists, the Rosarito-Ensenada bike ride is like a yearly pilgrimage. A 50 mile bike ride that highlights both the beauty and harshness of Baja California. And it happens once again this coming Saturday. In a sense the ride has risen from the ashes like a Phoenix for it's 30th anniversay. Last year it was announced that after 29 years, the ride would be no more. This was surprising to both locals and visitors who come from around the world, because this event at one point had gotten so popular that what was originally a yearly event, turned into 2 rides per year, one is April and in September. However with the however, the Baja Tourism board came up with funds in order to host the ride once again. So this coming Saturday, the 30th Anniversary ride is on! The best part of this ride is simply the scenery, and because the roads are closed to vehicles, you can actually enjoy it. You ride along the coast from Rosarito heading south for about 22 miles. On a clear day, the vast Pacific fills the horizon and the salty ocean breeze keeps you cool. That's important because then you head inland to face a climb the locals call "El Tigre." 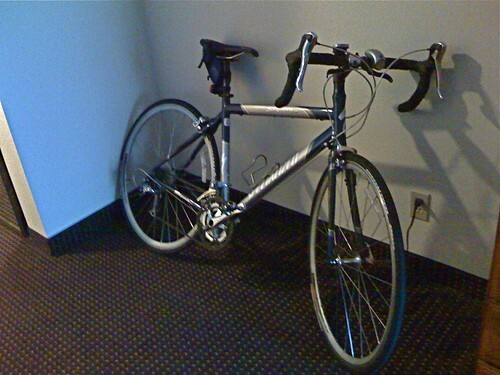 When I did this ride in 2007, with little to no preparation, I did the walk of shame, all the way up and over. I didn't have the legs. I promised myself that I wouldn't do that again. Last year, I was proud to ride all the way into Ensenada feeling very strong. Once you're over El Tigre, the descent can get a bit hairy, but after a few miles you find the Pacific again then it's about 10 miles into the city of Ensenada, where a big fiesta awaits at the finish line. Last September I did the ride in 4 hours and a bit. This year I'm hoping to get in under 4 hours. I'll let you know. Accumulate 4-5 hours of riding this weekend. Divide up the days however you want, but be sure to get in the time. Make one day hilly, the other day flat. On my last post I wrote about my leg busting Saturday ride. Sunday was supposed to be an easy 2 hour relatively flat ride. Well, Molly wakes up wanting to go for a ride. There is this 3.5 mile loop close to our house that I do when I want to do some long and short hill reps. We did four laps. By the end of the ride, my legs were like spaghetti. I think next time Molly says "lets go for a ride," I'm using the coach's orders as an excuse to not go. In reality the ride was a lot of fun, tough, but fun. I enjoy when we get a chance to ride together. Climbing was such a part of the cycling weekend that I even got into a conversation about it with a Twitter friend, Darby Collier. It just so happened that he did some climbing on Saturday as well, and his experience prompted him to post a pretty interesting article on the subject on his blog, Darby's Ride. It's titled 5 ways to Improve Climbing. It's great for those of you who might be starting out in cycling or just want a refresher. Check it out! Got off to a late start today. Got out of the house expecting a 3 hour ride, so I eased into it as I maneuvered the short hilly rides that take me to one of my hillier routes. I got over the first big hill on my ride and all of a sudden I feel a squirrelly rear. (The bike's, not mine.) Damn! Flat tire. After cursing a bit, then I realized my luck. I probably got the flat going down a hill at 35 mph. So, I got into my "Mary Poppins" Camelback backpack, pulled out some tire levers a C02 cartridge and a new tube. I was impatient fixing the flat and didn't make sure the tire was properly set on the rim. After I inflated the tire it had a huge bulge, so I had to re-do it. The lack of patience made my stop longer. Anyway, once fixed I got going and hoped for no more flats. I was out of CO2. The rest of the ride was great. I feel much stronger on the climbs these days. While there are no HUGE hill here, there are a lot of smallish ones, and one in particular long hill that has some very steep sections and false flats. Got through the climbs fairly well. Even had some juice to attack some rolling hills as I got close to home. By the time I was on the home stretch, my legs were complaining. Overall however, I knocked off 10 minutes off this ride from the last time I did it. And to top it all off, I saw the most beautiful sunset. I'll take a picture next time. I love Spring! I love seeing the explosion of color all around. And I love Daylight Savings Time (DST), when all of a sudden there’s that extra hour of daylight in the afternoon. The teacher part of me that faces a 50 minute commute and has to get up in the dark again isn’t so crazy about it, but the cyclist part of me gets ecstatic. Because of my schedule I’m relegated to riding after school. However when sunset is at 5:30pm or so, it’s difficult to get out of work, take care of issues after work, and then get a ride in before it gets too dark. This means I spend January and February in the gym working on the spin bike and very few miles on the road. However once DST rolls around, The Girl gets tuned up, the bike rack goes on the PT Cruiser and it’s time to ride! This past March was the month that I logged more miles on the saddle than in any other month in my life. I managed to log 380 miles on the bike. I had a pretty successful Solvang ride, and am feeling pretty good about climbing “El Tigre” on the Rosarito-Ensenada ride on April 16th. For the uninitated, El Tigre is a 2 mile hill that starts at sea level and climbs over 800 feet in just over 2 miles. It's the only real challenge in what is otherwise a breathtakingly beautiful ride. At this point my goal is to keep the momentum going. While I’ve set a goal of about 300 miles per month for the year, you can see by the chart I fell short in January and February. A few more months of March and I’ll make up the deficit. It has helped that I’ve been on Spring Break however I also have the motivation of a couple of rides that are coming up these next few months: The aforementioned Rosarito-Ensenada in April, the San Diego Century in May and the Los Angeles River Ride in June. The latter will be my first attempt at a full century! I’m feeling confident right now because DST stands for Days on the Saddle Time.